Welcome to the seventh issue of the Columbia College Class of 1963 eNewsletter. Apologies for its lateness, but it's Summertime, and the living is easy. Again, if you know how to contact any of these classmates, please let me know. And send me the names of your lost friends, and we will try to find them. Overall, a very quiet month on the notes scene, I hope that you are all have a good Summer, and will let us know what you did in the Fall. Please join your classmates for an informal lunch at the Columbia Club every second Thursday of the month. It is our hope that these gatherings will renew old friendships and foster improved relationship with our class and the College. We are skipping our lunch during these dog days of Summer, so the next lunch will be on September 8, 2005. The seventh Second Saturday Class of 1963 lunch was held on July 14. Although the numbers were small, we had two first-timers, Steve Bauer and Walter Stein, and the welcome return of David Alpern. What we lacked in quantity was made up by the warm recollections and interesting discussions. Here is the happy (and slightly-out-of-focus) group. 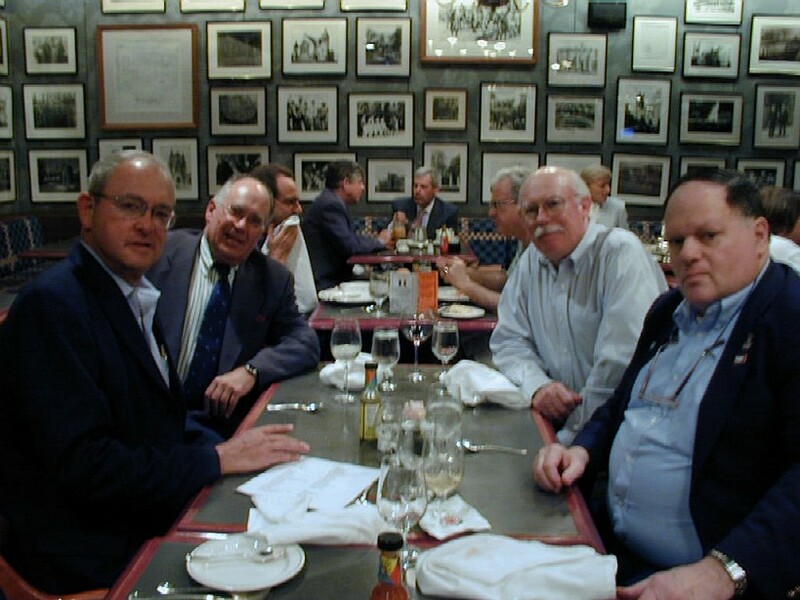 As I mentioned last month, the Class of 1964 has also decided to meet at the Columbia Club Grille each second Thursdays, and will be sitting at a table near us on September 8. If you have any friends in that class, encourage them to attend. I hope you can all join us at the next lunch on Thursday, September 8. Please let me know if you will attend so that we can reserve a big enough table; RSVP to Paul Neshamkin (pauln@helpauthors.com). Your messages are still a little slow this summer, but it's great to hear from you. Here is a selection of the unedited (and unexpurgated) notes and news that you have sent in the last month. Just a short note to let you know that I am not missing in any final sense -- I have simply been living in the beautifully marginal country of Canada for the last 38 years. A fine woman from Saskatchewan and two sage cats share an apartment with me over-looking a park. These past decades have been spent either teaching literature at Montreal's Dawson College, or working as a free-lance radio broadcaster for the Canadian Broadcasting Corporation, Radio Netherlands in Hilversum, Holland, and even for NYC's WBAI. My single published book, The Language of Silent Things, is a translation of Baudelaire's poetry and has a lived a subterranean life of its own. When I returned from Europe in 1990, I published a series of political pieces in Newsday, Commonweal, and The Nation. Since I hold both Canadian and EU citizenship, I have been thinking about how I could wangle someone into paying me for this duality, perhaps with travel grants included, but so far I have found that only a Department of English will pay for an individual to exercise his or her innate ambivalence. I warmly remember that year you and I roomed together as freshman, and I often find myself thinking about the outstanding teachers we all had. Many of their remarks still echo in my mind, such as Fred Dupee's acute throwaway line about Wallace Stevens: "Stevens is a Dandy." If, as Stevens wrote, one should know the "eccentric to be the base of design," then both Columbia in the early sixties and The West End Bar and Grill gave us great preparation for finding order in the dis-centered. Patrick, it is great to hear from you again. I, of course, have little recollection of what went on at the West End. But I do have some vague recollections of a trip to Birdland. I'm not sure how much order I've been able to find since. Since I saw the entry for my partner John Ake in the July 2005 edition of Columbia College Today, I thought I would add my two cents. I, too, have worked at the Philadelphia law firm of Ballard Spahr Andrews & Ingersoll, but in my case for only the last 13 years. Before that, I worked at the Dilworth Paxson Kalish & Kauffman law firm for 25 years. My specialty is commercial litigation and I have represented, and continue to represent, several Fortune 500 companies along with The Philadelphia Orchestra. For the last two years, my peers have recognized me as one of the top 100 lawyers in Pennsylvania. Since the survey has only been conducted for two years, I consider this quite an honor. Although it is by no means imminent, I am looking forward to our 45th class reunion. David, I hope that we see you before then. Try to make a lunch (and bring Ake) or come to the Homecoming and our minimal, but still planned, mini-Reunion (see below). Always great to hear from you all. I have heard nothing further from any of you in the last month either pro or con about the planned mini-reunion, so I will keep it informal and minimal. We will still move the regular Class luncheon at the Columbia Club to Friday, October 14, in case any of you are planning to return to New York for the Homecoming Game. On Saturday, October 15, I invite any classmates to join me at the Homecoming tent in the morning at Baker Field, and then watch Columbia beat Penn at the Homecoming game that afternoon. Let me know if you plan on attending, and I will get a block of tickets reserved so we can sit together. But other than that, I will not plan on any other "reunion" events unless there is a sudden show of enthusiasm. Please let me know. Maybe next year, we'll be able to organize a larger, more meaningful mini-reunion. As I asked last month, anyone want to volunteer to help me out?